How to improve employee engagement can be a head-scratcher for HR managers. We know how beneficial it is to productivity and performance - and we know the risks of disengagement. But how to reach employees when everyone's so busy? Glad you asked. Here are 19 simple but effective employee engagement best practice ideas for you to unveil at your organization. Feel free to claim them as your own ideas - honestly, we don't mind! There are many new and exciting ways for organizations to build engagement with employees, beyond the old classics of email and intranet. These include high impact, unmissable formats such as desktop alerts, chatty collaboration platforms and video, right through to more passive styles such as screensavers and digital signage. The skill lies in knowing which channel is right for the task. Building engagement can be a slow-burn using channels from across the communication spectrum. Communication tools that offer a richer, engaging and interactive experience, that bring corporate culture and story-telling to life, is how to win hearts and minds. Internal brand messages often get lost if they are buried in email or on the intranet. Bring brand messages to life with interactive, visually engaging communications channels such as messages on screensavers. Involve staff in creating brand values using quick and simple staff survey tools and plug and play discussion forums. Find out what staff know and think using fun staff quizzes. Not everyone is comfortable expressing their opinions in front of others. Use the desktop Staff Quiz tool to involve people. Invite them to name new ways of working (e.g. new systems, projects) or suggest improvements. Offer prizes for the best ideas (and recognize them using targeted corporate screensavers and articles in your newsletter or intranet). Smaller, face-to-face executive communications offer a personalized and engaging forum for leadership communication. Multiple time slots and venues can also help maximize the chances that employees can attend executive briefing sessions. But the challenge is ensuring staff register and subsequently attend these sessions. SnapComms RSVP Desktop Alert is an staff invitation tool that makes it easy to target appointments and manage multiple variables such as venues, times slots and personalized requirements such a transport or catering. The RSVP tool integrates with Outlook. Lead by example is a proven technique to model organizational values. Endorse those employees who have demonstrated great attitudes, ethics and alignment with the vision. Short videos, newsletter articles, screensaver messages are all ideal channels for showcasing this behavior. 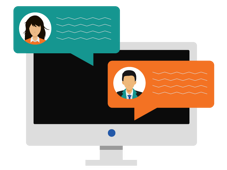 Implement confidential feedback channels that empower staff to ask questions about any aspect of the business and their role within it. This tactic often uncovers some hidden engagement issues, that an organization had no idea existed. These influential individuals can play a major role in persuading the cynics of the company. Raise the profile and reach of these individuals further through the use of blogs, regular updates, and newsletter interviews 'from their perspective'. Articles in staff magazines, updates on desktop tickers and even interactive corporate screensavers can be a great way to demonstrate to staff how their feedback is being used. SnapComms engagement communications tools make these updates quick, easy, targetable and measurable. Work with managers to ensure messages have relevance to different groups of staff. Be mindful of the communication preferences your employees may have. For example, younger staff may prefer bite-size content, delivered in short, regular bursts. Some functions or team may require extra comms efforts, particularly if they've been through a lot of change. The best development programs in the world can be overlooked if staff do not know about them. Ensure all employees are aware of the development programs available to them by promoting these courses using corporate screensavers, staff e-magazines and more. Desktop alerts and RSVP invites can help ensure maximum value is derived from events. Make sure employees understand how their unit contributes to the overall success of the organization. Expand their awareness beyond their own performance and extend it out into their team. Actively promote organizational effectiveness, reputation and ethics. Employees want to feel good about their leaders, where they work, the products they sell and the reputation of their company. Hence these types of engagement communications can be valuable. Corporate Screensavers can be a very fast and engaging method to promote ‘free goodies’ to staff. Anything from staff parties, discounted gym memberships to health checks, fun runs and fresh fruit can be promoted easily and effectively on corporate screensavers. Raising awareness of additional staff benefits can help employees feel valued and engaged. Direct line managers hold the greatest influence over how their team engages. Hold managers and supervisors accountable for their engagement, survey results and communications effectiveness. Measure their effectiveness and provide tools to support them. Hearing about an important update from media, colleagues or family and friends can have a negative impact on employee engagement. Ensure employees hear these messages from the business as soon as possible. SnapComms Desktop Alert format bypasses email and achieves fast, effective message cut through. Reporting options let you check which recipients have opened the message, and acknowledged (if required). Give administrator rights to managers and/or their assistants within SnapComms Content Manager so they communicate important information via a range of different formats. This is a great way to ensure sure staff get information relevant to them - as soon as it is available. Too often, leadership comms messages fail to connect with employees, as the language may be overly complex. Test content first with a small focus group and measure their understanding. Then, once published to the wider audience, use SnapComms Survey tool to gauge their feedback. Built-in reminders encourage staff to take part. Voluntary work, donations to charities, philanthropic initiatives - these have all become increasingly important to staff, as they expect their employer to have a social conscience. Corporate acts of kindness go a long way to build engagement among employees - just remember to promote these good deeds to staff. Great ways to celebrate these, as well as financial successes, are via visual formats. Transform passive desktop screens into lively, informative billboards using corporate screensavers from SnapComms. Go one step further with interactive corporate screensavers by sequencing content. This is a great way to build engagement with visual communications to highlight and celebrate successes. SnapComms targeting features enable you to use corporate screensavers to communicate good news and successes to specific groups in your organization. Dedicate a section in the SnapComms digital newsletter for personal development and current vacancies. Workshops, training opportunities and staff support schemes can all be featured in the newsletter, and on interactive screensavers. Now you have an abundance of employee engagement ideas, start planning them out for 2019 with our free HR calendar filled with useful information for you to make an effective employee communication plan.